Oxford Learning Centre is the winner for the following category: Best Learning Centre in Barrie. In a recent poll done by the Barrie Examiner, Oxford Learning Centre was nominated as a business that deserved special recognition as one of Barrie’s Best Businesses. The votes are in, and we won our category! Come in to the Barrie Oxford Learning and see the Oxford Learning Difference for yourself! We can't emphasize enough how important summer learning really is. Make sure to keep Oxford Learning in your plans for summer 2019 to avoid the stress you may have felt starting back at school this year. Check our our summer newsletter for amazing specials! Team Oxford Learning is the Best! Good morning I just wanted to drop a quick note and say thank you for a wonderful afternoon skating. Nick and I especially wanted to thank you Katie and Brent for helping out the kids on the ice. It was pretty tricky with 4 of us being newbies and 1 experienced skater. Lol! Anyways thanks a bunch. Thank you again for your understanding and amazing flexibility. Carly was so proud to announce that she won the reading contest and show off her water bottle that says ‘Oxford Learning!' The life skills you are teaching are showing, and as a result, Carly’s self-esteem and confidence are soaring! These are real results that no one can take away and results that are so important for all areas of her life. Thank you. The Oxford Learning Barrie North location has an opening for an upbeat, dynamic Math & Science teacher who wants to work in a rewarding teaching environment. Candidates must possess a strong passion for seeing students succeed, and must be comfortable teaching students ranging in age from Grade 9 – Grade 12, in all high school strains of Science and Math. This individual should also be comfortable tutoring a few students in both English and Math from Grades 1 – 8. If you possess all of the above qualities and want to join a high-energy group, with a goal to see students succeed, then please email resumes and cover letters. Oxford Learning Barrie is looking for committed, reliable and FULLY BILINGUAL enthusiastic individuals who enjoy working with JK-Senior aged students. Our Programs offer personalized support to students looking to develop strong learning skills utilizing proven Cognitive Development tools and methodologies. We also focus on building strong academic skills, particularly in literacy and math. Interested candidates must be available weekday evenings from 4-8pm and Saturdays from 9-2pm. Availability during weekday mornings and afternoons will open the opportunity for increased hours. Hello! My name is Amanda, and I am the Centre Manager at Oxford Learning. I am a graduate of Nipissing University, where I completed a Bachelor of Education and Bachelor of Arts (majoring in English). Recently, I lived in England for a year, while I completed my Master of Arts in English, and was lucky enough to do a bit of travelling while I was there. I have coached, tutored and taught students since I was in high school, and I love getting to know students and figure out how they learn best! Outside of Oxford Learning, I am an avid reader of everything from spy novels to historical fiction, and I love to be active, whether it be skating, skiing, canoeing or hiking. To learn more about Barrie tutors, contact Oxford Learning® today! Conveniently located in Barrie, Oxford Learning® provides parents and students in Simcoe County with tutoring programs that use an engaging, hands-on approach to learning. Whether your child needs help catching up or is looking for more of a challenge, our tutors can help your child reach his or her full potential. Our tutoring centre in Barrie provides students with customized tutoring programs in areas including Math, English, Science, French, study skills, and more. Our Barrie tutors help students of every level build the skills and confidence they need to achieve results and succeed in every area and subject. 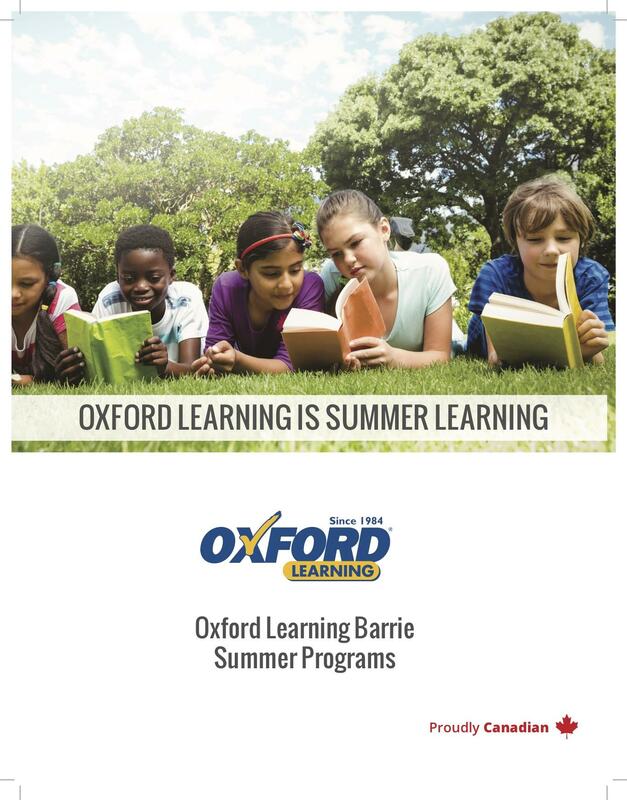 Oxford Learning® welcomes students from Barrie and surrounding areas, including Shanty Bay, Midhurst, Grenfel.